This past weekend concluded another excellent PAX convention, easily the largest convention dedicated to games and players. Scott and I had the opportunity to attend a bevy of fascinating panels (you might have noticed). One of our favorite panels was actually more of a lecture. Hosted by Andrew Mayer, the designer of Petz and currently a social games consultant. Besides giving an excellent lecture and presentation on the future of games, he also coined our new favorite term: Farmpocalypse. 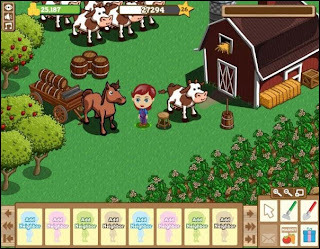 Mayer has an expertise in Facebook games, and heralds the increasing popularity of farming games amongst an increasingly diverse and casual crowd. 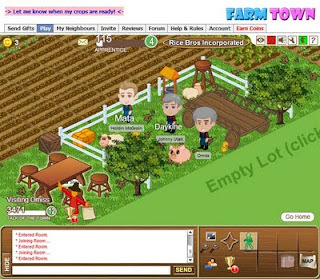 Playable in any web browser, farm games have stormed Facebook with a frenzy of users. Farmtown, Farmville and MyFarm are but a few, and the number is growing. These games rake in large profits, mostly through advertisements and offers, and there doesn't seem to be an end to their viability as profitable browser games. The end is truly nigh, and most surprising, my mother is one of the four horsemen of the Farmpocalypse. Let me preface the rest of this piece by saying I am actually a fan of farming games. I find immense satisfaction watching my crops grow to harvest. So I do understand the appeal in a browser based farming simulator. As Mayer discussed, these games are very approachable, offering easily perceived values, daily rewards, and simple repetitive actions - they create what Mayer calls "bite-sized grinds." But why does my mother like this game? I grew up with her tolerating my game playing, but I never thought she would become a gamer herself. She does, in fact, consider herself a gamer. During a long discussion of her virtual farming practices, my mother confessed to playing a inordinate amount of Farmtown , albeit in small chunks of time. She supplements this time by planning crop rotations, scheduling harvest times, and chatting with co-workers. This is where things get interesting. Mayer discussed the changing approach to user metrics; it seems finding out who plays is less important than finding out how they play. For my mother, the two seem inextricably tied. My mother's experience is fundamentally defined by the office environment in which she plays and her farming colleagues. 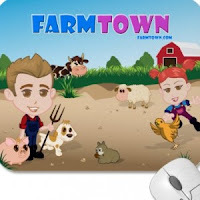 It was a co-worker who first introduced her to Farmtown, and she quickly found herself amongst a cadre of office farmers. Nearly every woman in her office plays at least occasionally, with a few outliers resisting their co-workers call to plowshares. The office acts like a team, breaking up their work schedule by building their own farms and acting as cheap labor for the others. Mutual cooperation improves their own standing and give them a chance to see their compatriot's farms and houses. Inevitably, comparisons are made between users. As Mayer mentioned, showing off is crucial to the experience, it also fosters competition. My mother proudly regales me with her status relative to her co-workers. She is a good farmer, willing to plant risky crops for high reward, but she is far from the best. There is one woman at the office who has a particularly nice house, and another who has let her farm collapse, unable to catch up to the office leaders. Thus, Farmtown is overtly cooperative, but covertly competitive. Office-Game relationships emphasize relative gains, with each participant eager to match, if not surpass, the accrued wealth of their friends. In game achievements and announcements create virtual pride and jealousy. In fact, the entire system looks very similar to existing office culture. In an environment that combines teamwork with the chance of individual promotion, office workers become adept at measuring the relative success and failures of their co-workers. Office behavior has changed to match this new environment, with most office employees attached to a farming alter-ego. Mimicking the day-to-day search of rewards and failures found in even the minimally competitive office environment is not necessarily a bad thing. Players do feel satisfaction and pride for themselves and for others. A safe place to simulate and manage office pressures may be very rewarding. If it weren't for office culture, the game would just not be the same. Gauging the relative importance of various game features, I asked my mother if she would continue playing the game under certain circumstances. She would stop if her co-workers did not play. She would likely stop if she could not visit other people's farms. She would stop if there was no more stuff she could purchase for her farm. She even pays attention to developer updates in case a change threatens to alter her play experience. She also discusses the game design with her co-workers. Relationships in the office are slightly different because of this. The Farmpocalypse has made my mother a gamer, but one of a particular breed. She has become an educated consumer as well as a mini-marketer, converting Facebook friends to farm hands. Social gaming has changed her office culture in subtle ways, the same office culture that I believe makes her amiable to Farmtown in the first place. Social gaming changes social environments at the same time it is informed by them. The post-Farmpocalyptic landscape is a strange place indeed. Although I'm late to the show, just wanted to say that this is a fantastic post. I really get a sense for what SimFarm. * players (particularly your mother and her co-workers) are invested in when they play the game. I've noticed that university students too get involved in the game, in the kind of "competitive co-op" style of play that you seem to be talking about. Part of the value of these games is that they have an old history - SimFarm was a tremendously good game that took the Sim. * series to a level of what I think of as "playable realism"... not so overly technical that it becomes a sandbox simulation (ie. SimEarth), but with enough technical elements and strategies to invite the player to explore and come up with creative solutions to realistic problems the game presents. The social aspect of these Facebook games are of course a major part of it, and I honestly believe that this is a vast improvement over the old single-player mode. The only thing missing, potentially, is the kind of narrative found in the Harvest Moon series - a story that grips the player enough to encourage them to continue despite having no instrumental bonuses for doing so (ie. co-worker jealousy). Again -- nice too see a game writer actually concerned with people's social experiences of games. I don't see that often! I'm glad you liked it. And I generally agree with you regarding social games marking an improvement over the single-player mode. It's such a different experience, particularly when you bring in competitive behavior. Which actually concerns me a bit when developers mention the inclusion of facebook/social networking additions to their game, to better compare yourself with your friends. It's a more persistent competition when on daily-used social sites like facebook, than, say, your generalized gamer score on XBox. That might be detrimental for the future of narrative in these sorts of titles. On the other hand, jealousy and competition makes for an interesting personal narrative.